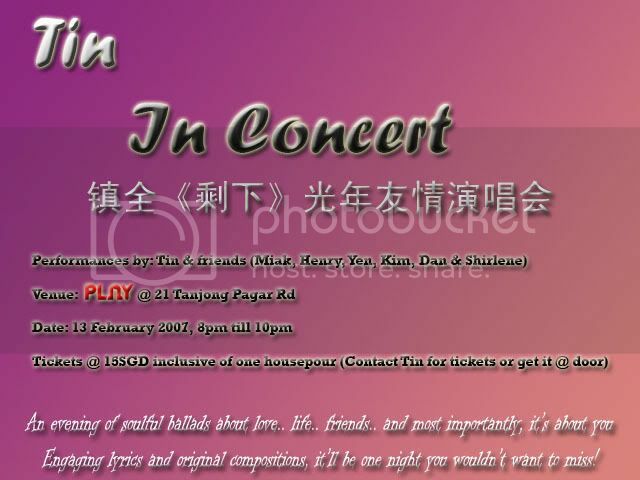 :: Tin's Concert Promo Final Edition :: (From Tin) Ola! !… - Dreams are what you wake up from. starting 9pm and onwards on Friday and Saturday night. of which some i will pass over to Miak. tickets are priced at SGD$15 per pax. Juices & Soft Drinks (Coke & Sprite). Door gifts: 75 X $5 vouchers for Instant Karma Shirts and Accessories. Hence, for the first 75 patrons only! Taiwan, Bangkok, HongKong, or whatever? bro u really arh... smart . from promotion ..marketing :p ..
this is called spreading the good cheer! such as your surprise appearance?